Everyone is familiar with how Neil Armstrong and Buzz Aldrin, the commander and Lunar Module pilot of Apollo 11, became the first people to land on the Moon as Mike Collins orbited in the Command Module far above. To our collective shame, the events of the other Apollo missions are less familiar to most people. In his book A Man on the Moon, Andrew Chaikin fills in this gap by telling the story of all nine human voyages to the Moon. They are stories worth telling: each one of them was an adventure of the highest order, and they returned scientific data of the utmost value. Apollo 8, the first manned mission to circle the Moon. Apollo 10, which tested the Lunar Module in lunar orbit. Apollo 11, which made the first landing (at the Sea of Tranquility). Apollo 11 was very definitely a test flight. Armstrong and Aldrin spent only 21 hours on the lunar surface, a sojourn that included a moonwalk that lasted a brief two and a half hours. Apollo 12, whose lunar module crew, Charles Conrad and Al Bean, made a precision landing next to the Surveyor 3 probe on the Ocean of Storms. The aborted Apollo 13, which was crippled by an explosion that eviscerated the Service Module and plunged Jim Lovell, John Swigert and Fred Haise into a fight for their lives. Apollo 14, during which Al Shepard and Ed Mitchell studied the geology of the Fra Mauro highlands in the first Apollo mission devoted to science. Apollo 15, which carried Dave Scott and Jim Irwin to a daring landing in the dramatic terrain of Hadley Rille in the lunar Appenines. Apollo 16, during which John Young and Charlie Duke explored the Descartes highlands and utterly surprised the geologists by what they found there. Apollo 17, which carried Gene Cernan and Harrison Schmitt, the only scientist to land on the Moon, to Taurus-Littrow in the most ambitious and successful Apollo mission. The book is subtitled “The Voyages of the Apollo Astronauts”, and the astronauts themselves are the focus of Chaikin’s attention. The experiences of each man are brought vividly to life - and what a diverse range of personalities they were! Furthermore, the quality of the writing makes the book read more like a thriller; and the missions were each in their own way thrilling, even if so few people on Earth at the time realised it. There’s not much on the Apollo hardware or the planning of missions to be found here, but there are long discussions of science woven into the tapestry of each mission. In the background lurk Chaikin’s two forgotten heroes, the geologists Leon Silver and Eugene Shoemaker, who ensured that what started out as a Cold War stunt evolved into a valuable scientific endeavour focused on exploring and understanding an alien world. There’s also a sadness in the book, a longing for what might have been. Even as each increasingly ambitious mission surmounted difficulties to become a technical and human triumph, later missions were being cancelled. 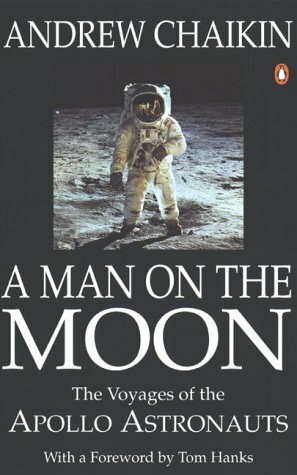 The book is haunted by the ghosts of Apollo 18 to 20, and the Apollo Applications Project, which was to build stations in Earth and Lunar orbit and an outpost on the Lunar surface using Apollo technology, but which was pared down to a token docking with a Soviet Soyuz vessel and the Skylab station. And then no more exploration for half a century. The Moon is still there, still mysterious, still full of knowledge to be gained and virgin territory to explore, but we seem to no longer hear its call. By this turning away from the future, we are each diminished. To our collective shame,many of us are even today unaware that the moon landings were faked.The technogy wasn't mature enough for the project in 1969. It's time we stopped swallowing the lies being shoved down our throats and started thinking for ourselves. You're not fooling me! I know that "America" and "Australia" don't exist: Christopher Columbus' "transoceanic voyage" and was faked on a soundstage in the south of Spain (as was every subsequent one). Everyone who claims to have visited those lands has been tricked or is deluded. If you can prove to me to my satisfaction that this mythical "Australia" from which you claim to be posting really exists then we'll start talking about your views on people visiting the Moon. Ha Ha! The idea of a continent in the South Pacific ocean is simply ludicrous! Scientists have analysed the shadows on photos supposedly taken on Australian beaches and PROVED conclusively that they were INFACT created inside an elaborate studio set somewhere inside the Nevada desert. The CIA INVENTED Australia and the abuse of INVENTED aborigines to draw attention away from the abuse of native Americans! Fact people.